WHY NOT YOUR HOME AGAIN? Real estate is all about location. You’re ready to upgrade, but don’t want to leave the neighbourhood you’ve called home for so many years. It’s the neighbourhood you built memories. It’s the place your children built important friendships. The best thing you can do at this point is not to sell your property, but to simply rebuild your home. Building on your own property means you can design your custom home the way you want it. You know the advantages and disadvantages of your lot. You know you like the way the sun comes through the south side windows in the fall and spring. You know you’d love a better view of your large mature tree in the backyard. These are all things we can take advantage of when designing your new home. Building on your own property makes your home truly custom. Plus, with the rising home prices, the return value of your new custom build or addition will far surpass the cost of construction. Think about how much you would save in realtor fees, lawyer fees and land transfer taxes. Why not put all that money into building the home of your dreams in the neighbourhood you already love? 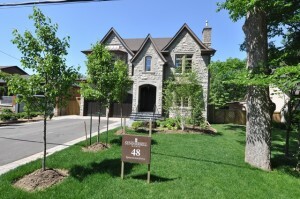 We at Summerhill Homes have the experience and vision necessary to build the custom home of your dreams. We take the time to listen to your desires and interpret your ideas build to the best possible home for your budget.